Gung Haggis Fat Choy Dinner tickets available SOON. Tickets available soon…. through Firehall Arts Centre. $60 each or $600 per table. countdown to Chinese New Year…. EXTRA Chinese New Years celebrations. + Countdown to Chinese New Year's Eve! This entry was posted in Gung Haggis Fat Choy dinner, Gung Haggis Fat Choy DINNER 2009, Main Page on November 26, 2008 by Todd. Donna Lee entered a film in the CBC Radio contest called Migrations. She is in the semi-final, and needs a push from all you good folks. I first met Donna during the Head Tax redress campaign. She did some filming when we protested against then Prime Minister Paul Martin. Maybe our protesting led to his downfall? It caught media attention. Check out Donna's film – which gives the often untold story about how families were separated not only because it was TOO EXPENSIVE to bring a wife or family to Canada (Remember $500 in 1923 would buy a small house), but because the “Chinese Exclusion Act” made it impossible to enter Canada 1923 to 1947, if you were Chinese. No other ethnic group was specifically targeted. I guess they knew that Adrienne Clarkson was coming. semi-final rounds of a people's choice online voting competition. it's available for viewing for this round from Thurs Nov 20th to the 26th. There are many other fine shorts on the subject of migration – enjoy! Many thanks for allowing me space for artist-self-promotion-type-of email. This entry was posted in Asian Canadian Cultural Events, Chinatown Vancouver, Chinese Canadian History, Chinese Head Tax issues + Gim Wong's Ride for Redress, Commentaries, Food & Restaurants, Main Page, Multicultural events, Vancouver Heritage and History, Visual Art and related events on November 26, 2008 by Todd. This week I am attending the BC Federation of Labour conference November 24-28, 2008 at the Vancouver Convention & Exhibition Centre. There are approximately 1200 delegates. We have 5 delegates from CUPE 391 Vancouver Library Workers. President Jim Sinclair gives a talk about the importance of labour unions. He also emphasizes the challenges that migrant and immigrant workers are faced with, citing the deaths of Vietnamese-Canadians at the Fraser Valley mushroom farm, and workers from Eastern Europe working on the Golden Ears Bridge left in lurch when the contractor moves. Sitting behind Jim, I can see Bill Saunders president of Vancouver & District Labour Council. I met Bill in 2007 when when he gave a talk for the Anniversaries of Change Reconciliation Dinner that commemorated the 1907 riot in Chinatown by Caucasian labourers. Immigrants and migrant workers have never had it easy in British Columbia. Employers still exploit workers for their own personal profit. Workers get killed in vans that don't have seat belts. Regardless of race or ethnicity, this is shameful. Vancouver Mayor-elect Gregor Robertson gave a welcome to delegates, and again pledged his goal to end homelessness in Vancouver by 2015. He spoke about repairing the damage to relations with Vancouver civic unions CUPE 1004 (outside workers), CUPE 15 (inside workers) and “in particular CUPE 391” (Vancouver Library Workers). Robertson talked about the importance of giving more respect to civic unions, but also to the citizens of Vancouver. He said he is is asking all groups he talks with, business, unions, community groups and citizens – to give more to help end homelessness. I believe that the role of labour and the right to work is also fundamentally important to one's self-esteem and self-worth. Having a job will go a long way to helping end homelessness too! Sitting in the visitors gallery, were many newly elected or re-elected politicians in the recent civic elections such as Richmond councilor Harold Steeves. From Vancouver City Council, councilor Raymond Louie and councilors-elect Andrea Reimer, Geoff Meggs and Ellen Woodsworth, Parks commissioner-elect Aaron Jasper and School trustee-elect Jane Bouey. Stephen Lewis' address was the highlight for many conference attendees. My fellow delegate Ed Dickson and I marvelled at Lewis' dramatic delivery and his oratory skill. Lewis was able to address gender equity, global poverty, AIDS, the labour movement, capitalism gone bad, his work as a United Nations envoy, the G-20, the IMF, sexual abuse in the Congo, Obama, Sarah Palin, Bono, and a talk by Desmond Tutu – all as seamless interconnected issues. Lewis talks about U2 rock singer Bono, who asks why is it possible for the US and other nations to find $700 billion to help bail out Wall St. but not $250 million for the agreed upon Millenium Development goals from the 2000 UN Summit. Lewis then went through each of the Millenium Goals such as child poverty, AIDS, disease control, hunger, and sustainable environmentalism. He said he was disgusted by corporations asking for bail outs during this latest economic disaster which was caused by big business asking for more de-regulation so “they can do what they want.” He cited the audacity of big business to fly to meetings with government in their corporate jets asking for hand-outs of taxpayer money. and amazing address by Stephen Lewis. Following his address, Lewis was given a gift. He opened the giftwrapped package to reveal a framed print. He described the pastoral scene with clouds, then read the quote from J.S. Woodsworth, dedicated to the Canadian labour movement. This entry was posted in Main Page on November 25, 2008 by Todd. Todd Wong – a cultural czar? Georgia Straight gives 50:1 odds. With every new government, be it federal, provincial or municipal – there is sometimes a shake up in administration, as the new government wants to put people in place that will better reflect and carry out their policies. The Georgia Straight's Charlie Smith is speculating there may be changes at Vancouver City Hall. Meanwhile Pieta Wooley of the Georgia Straight reported that Vision Vancouver counselor Heather Deal told the Straight the party will be discussing staffing changes in the city’s Office of Cultural Affairs. see: New Vision for Vancouver arts community. This comment let Charlie Smith to speculate what could happen at Vancouver's Office of Cultural Affairs. Would present managing director Sue Harvey stay or go? If so who would replace her. Smith suggested possible names, and then for fun, gave odds for the possibility that such names might get the job. see: Duncan Low, Jim Green, Judith Marcuse: a short list for new cultural czar Nov. 20. Certainly arts manger Diane Kadota and dance choreographer Jay Hirabayashi of Kokoro Dance come to mind. Kadota has also been involved with the Powell St. Festival, while Hirabayashi founded the Vancouver International Dance Festival, and is a former board member for the Vancouver Arts Alliance. While it is fun to speculate, I can't take Smith's suggestion of me seriously. I am currently focused on making sure that the Gung Haggis Fat Choy Robbie Burns Chinese New Year's Eve Dinner set for January 25th, 2009, will be the best Gung Haggis dinner yet. There are plans to expand the dinner to other locations outside of Vancouver, as well as to be involved with other related projects. It's been a big year of recognition for me already with receiving the BC Community Achievement Award in April, as well as having my full-size picture included in “The Party” exhibit at the Royal BC Museum. will be part of that change is anyone's guess. This entry was posted in Main Page on November 24, 2008 by Todd. The Vancouver Inter-Cultual Orchestra is an incredible meeting place of highly trained musicians from many cultural disciplines from around the world. Unique to Canada, and the world…. they specifically perform original and adapted works for an intercultural setting and audience. featuring astounding Iranian tenor Amir Haghighi. Tickets: $20 / $10 (students, seniors, VICO members, groups of 10+). Tickets can be bought on-line at www.vi-co.org or at the door. 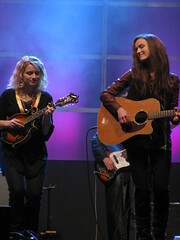 This entry was posted in Asian Canadian Cultural Events, Main Page, Multicultural events, Music, Scottish, Gaelic, Irish Celtic events and stories on November 22, 2008 by Todd. How long have I known you, Oh Canada? A hundred years? all the Indian people throughout the land. winds, once roamed your good lands…..
Will these words be repeated? 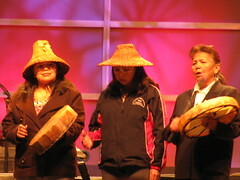 aboriginal poetry is taking place from noon till 9 p.m. This entry was posted in Literary Events, Main Page, Multicultural events, Upcoming Events on November 22, 2008 by Todd. Damon Calderwood is FANTASTIC in his peformance of “Billy Bishop Goes to War”: at the Deep Cove Shaw Theatre. Moments of applause burst throughout the performance at all the right places. There have been standing ovations every night, except once “when we turned the houselights up too early,” producer Jack Smith told me. This is a show you wished you had seen earlier, so you could tell all your friends about. real. Playwright John McLachlan Gray attended the opening night performance and said “it's a very clear production,” pleased that Damon really undoubtedly “becomes” each character… instead of merely playing them. I just wanted to send out a final reminder about Billy Bishop Goes to War (my long-awaited and finally-realized dream role!). pictures from our invited dress rehearsal. that wants to can get a ticket! $18/$15. minutes from the second narrows bridge. amazing ride for Gordon and I. This entry was posted in Canadian Identity & Heritage, Main Page, Music, Recent Reviews, Theatre, Upcoming Events on November 22, 2008 by Todd. What really goes on behind Vancouver's pricey Coal Harbour condominium closed doors? Michèle Lonsdale Smith has written The 21st Floor. It is a voyeurist look into the mundane, sordid lives of Vancouver condo dwellers who don't know their neighbors on the same floor of until something happens. We discover what brings them together and keeps them apart. It's ironic that people can live so close together but never know their neighbors. Smith explores this and gives the performers the freedom to creatively explore their emotional and physical ranges each night. The set is lucious. It opens into windows that reveal the surrounding Coal Harbour buildings. You can actually look into the rooms of surrounding condos. But the real action takes place in each of the 8 little rooms surrounding the PAL theatre space. Each character represents typical but exotic stereotypes of Vancouver condo dwellers: The yuppie developer's son; the cold yuppie lawyer; the drug user model; the hick from Alberta; the podcaster; the gay couple; the sexaholic. Stir and mix… taste the results. Tangy. Sweet. Bitter. This entry was posted in Main Page on November 20, 2008 by Todd. 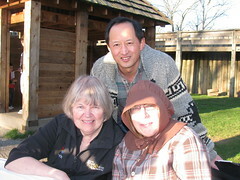 Todd Wong with Jean Barman, author of British Columbia: Spirit of the People, and Judy, president of the Friends of Historic Ft. Langley. 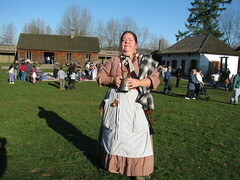 All proceeds of the book sales went to Friends of Fort Langley National Historic Site. I've known Jean for a number of years, she is one of BC's most prolific authors of history. It's always great to see her. Yes, I finally bought a copy of the book, British Columbia: Spirit of the People, published by Howard White's Harbour Publishing. It's a beautiful coffee table book, filled with incredible pictures and stories. This entry was posted in Canadian Identity & Heritage, Cultural Fusion, Main Page, Multicultural events, Scottish, Gaelic, Irish Celtic events and stories, Vancouver Area Adventures, Vancouver Heritage and History on November 20, 2008 by Todd. Visit Ft. Langley on Douglas Day…. 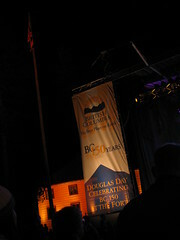 It's Douglas Day in BC. For more information on the provincial celebration, including evening concert details, visit the BC 150 website. in Fort Langley’s Big House declaring the territory a British Colony. be out in force providing activities and fun for the whole family. Kids can try their hand stringing cranberries, rolling a barrel or tackling an obstacle course! 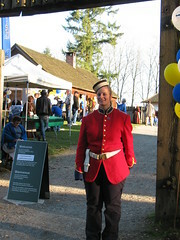 Be a part of your provincial history on November 19th at Fort Langley NHS! This entry was posted in Main Page on November 19, 2008 by Todd.